Next time you're feeling a bit frazzled, try this calming spritzer. When you use certified pure therapeutic grade essential oils, this spritzer is safe to use on children as well as adults. 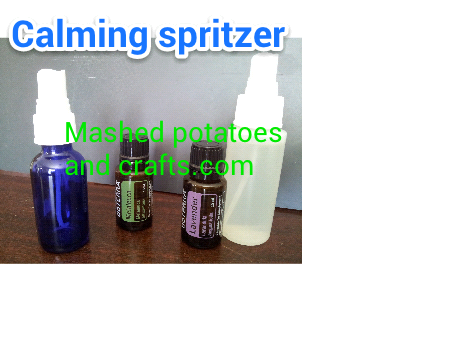 Fill a small spritz bottle (about 4 to ounces) with water. It's recommended to use glass bottles with essential oils because they can break down the plastic, but with this blend I've used a plastic bottle because it's mostly water and also because I use the spritzer frequently, the oils aren't sitting for long periods of time. Add three drops of lavender and one drop melaleuca essential oils. Or mix it up with your favorites. A great blend for energizing is peppermint and lemon essential oil. Shake the bottle lightly to mix oil and water. Now you can spray a refreshing mist over your face, hair, or clothes.